Heartwork is a synthesis of Eastern meditative approaches to healing and Western psychology and philosophy, using awareness as the primary vehicle to see into the source of one’s problems. The basic assumption of Heartwork is that our fundamental state is wholeness. Dis-ease is a separation from this wholeness. These transformational events offer an opportunity to learn and internalize powerful tools in a supported setting and offer the possibility of personal breakthroughs and life-changing experiences. 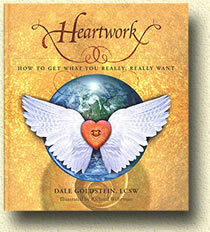 Email the Heartwork Institute at awakentheheart@gmail.com for more information. In-person, Zoom, Skype, Face Time, and phone Heartwork sessions are available. Email Dale directly at dalegee22@gmail.com.